There is 24 hour access to our self-catering facilities, plus free tea & coffee. We also have excellent budget meal options, including a buffet style monster breakfast and delicious home-cooked evening meals using local produce. Breakfast from £3.95. Packed Lunch from £3.95. 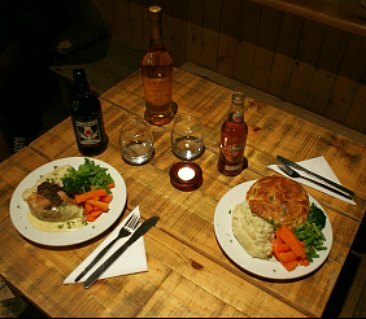 Evening Meals from £8.50. Our evening meal menu has four options and changes nightly, so please contact us to find out what's on. Options range from our infamous Chicken stuffed with Haggis to Sunday Roast to Hearty Lasagne. We also cater for food allergies other dietary requirements. Please note evening meals are to be ordered by 4pm for 6:30pm service. 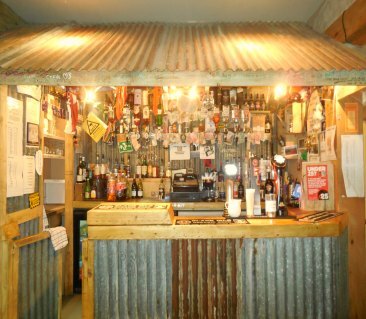 The rustic bothy-style bar offers a superb range of local beers to quench your thirst after a day adventuring. Looking for something a bit stronger? We have a great selection of Single Malt Whisky and passionate staff to hep advise you which to try (although we all have different opinions as to which is the best!). We have a cosy log fire for the colder winter nights, and regular live entertainment. You may even be lucky enough to stay on a night we are hosting our infamous Pub Quiz! The lounge is bright and spacious with plenty of areas to wind down and relax. Free Wi-Fi, squishy couches and glorious views of the surrounding hills - you might not want to leave! Take advantage of the book swap, toys & games, DVD’s, or entertain fellow guests with the famous red piano! We also have a lovely garden area with picnic benches and a pond to attract the local wildlife. We LOVE dogs as much as our human guests! Well-behaved dogs are welcome overnight for an additional charge of £10 to cover extra cleaning, this is a one-off charge regardless of number of dogs or number of nights booked. Dogs can be booked into private rooms only and may not be permitted in the kitchen or dining areas. We also have free poo bags, water bowls and biscuits if you need them. We want to make everyone’s stay with us as enjoyable as possible and are committed to providing suitable access for our all customers whatever their individual needs. To find our Access Statement please click here Please contact us to discuss any individual requirements.